Lagana (Greek: λαγάνα, from λάγανον) is a Greek focaccia-like flatbread traditionally baked only for Clean Monday, the first day of Great Lent, and it can be found in every Greek bakery. 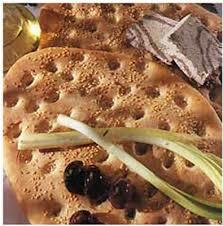 Traditionally, it was prepared unleavened (without the yeast), but leavened lagana is nowadays more common. It is typically flat, oval-shaped, with surface decorated by impressing fingertips. Sesame seeds are a common topping, and it may also be topped with other herbs, and seasoned with olive oil. The name comes from a Greco-Roman pastry dough lagana, which is also the origin of the word lasagna, also known as tracta, from the Ancient Greek τρακτὸς. Despite its present-day Christian connotations, some claim that the making of lagana can be traced all the way back to Ancient Greece, when it was a flat, unleavened bread known as laganon. This bread was mentioned by ancient writers including Horace and Aristophanes, whose play Ecclesiazusae (The Assemblywomen), from 392 B.C., wrote “laganas stéte”, meaning “laganas are made”. As for Horace, a legendary Roman hero, he mentioned the lagana in his writings as “the sweetness of the poor” in 507 BC. One theory is that this bread is referred in the Old Testament as the unleavened bread that the Hebrews ate the night before the Exodus of Egypt, under the guidance of Moses, and this type of bread is eaten until Easter, when Christ blessed the leavened bread. It is also said that the unleavened lagana bread, originally prepared only with flour and water, had to be flat as Christians should not “rise” with insolence and arrogance so that they are ready to engage in religious activities, such as prayer. Lagana also symbolized the purity of the soul, since people considered fermentation as a process of modifying the initial state of the bread ingredients, and therefore destroy its purity. It should be noted that the first three days of Great Lent are traditionally very strict fasting days, when nothing but water is consumed. However, this practice is today only kept by the most devout. Most Greeks today celebrate on this day by having a picnic and flying kites, keeping in mind the saying of the Lord: "When you fast, do not look somber as the hypocrites do, for they disfigure their faces to show others they are fasting. Truly I tell you, they have received their reward in full. But when you fast, anoint your head and wash your face, so that your fasting will not be obvious to men, but only to your Father, who is unseen. And your Father, who sees what is done in secret, will reward you" (Matt. 6:16-17). 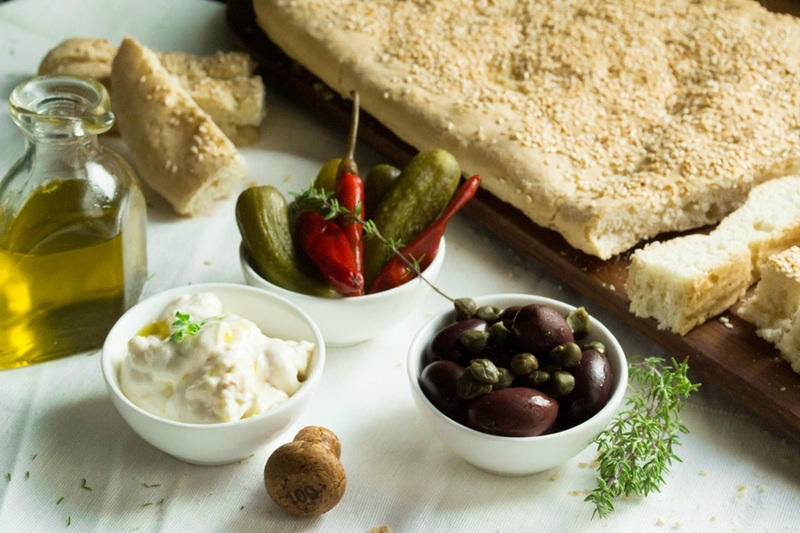 On Clean Monday the lagana is usually eaten with halva, olives, onions and taramasalata (salted fish roe mixed with mashed potato, vinegar and lemon juice).